If you’ve been hanging out here with me or over at Better In The Dark then you’ve probably heard me going on and on about how much I miss Manhattan’s 42end Street of the 70’s and 80’s. I spent a lot of time and money seeing movies on that old street, lined on both sides with grindhouses. If you had even as little as ten bucks in your kick you could spend the whole day going from one theater to the other watching double and even triple features. I guess that’s why I liked TRUE LEGEND so much. Even though it is extremely well made, professionally polished, slick and a lot of money obviously spent on it, it was made in the true spirit of those Kung Fu epics of the 70’s and 80’s. There’s just enough story to support us from one scene of spectacular asskicking to the next and it’s a wild story that goes from one twist to another with a gleeful abandon in a way that satisfied a long-time Kung Fu movie fan like me. The movie opens with the great warrior General Su Can (Vincent Zhao) rescuing his prince from a forbidden mountain top fortress. Any movie that opens with an insanely over-the-top battle that most movies would have ended with catches my attention right away. In gratitude, the prince wants to give Su a governorship but Su turns it down. Su persuades the prince to give the governorship to his step-brother Yuan (Andy On). Su wants to go back home to be with his wife Ying (Zhou Xun) who is Yuan’s sister and open up his own martial arts school. We jump five years ahead and now Su is a renowned Wu Shu master, raising a son, Feng with his wife and preparing to welcome Yuan home. It’s a bloody homecoming indeed. Yuan has hated Su for years because Su’s father killed Yuan’s biological father. Su’s dad raised the boy and his sister as his own children but Yuan’s the kinda guy who holds grudges for a looooong time. To ensure his revenge, Yuan has learned a forbidden evil martial arts technique called The Five Venom Fists and has had some really wicked, demonic looking armor grafted onto his arms, legs and torso. Yuan’s kills Su’s dad, Su’s entire household of retainers, staff and family. And that’s just before lunch. Before he’s through he’s beaten the piss outta Su and thrown him down a waterfall. Ying follows her husband and Yuan thinks they’re both dead. Not so. They’re found by a herbalist physician, Sister Yu (Michelle Yeoh) who nurses them back to health. Su is obsessed with once again fighting Yuan and getting revenge. But his confidence is shattered. He regains it when he encounters The Old Sage (The Great, Great Man Gordon Liu) and The God of Wu Shu (Jay Chou) and begs to be their disciple. The Old Sage tells him that once he defeats The God of Wu Shu he can be their disciple. Now that’s all the set-up I’m going to give you and actually it’s all you really need as from here on out the movie goes in a couple of directions that you really need to be ignorant on if you want to truly enjoy it. 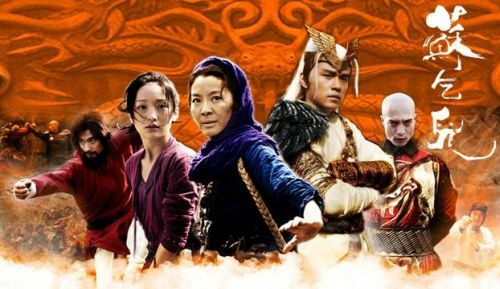 The acting in this one is nothing to rave about but let’s be honest here; you don’t watch a Kung Fu/Martial Arts movie for Academy Award winning performances. But it’s always good to see Gordon Liu in a Kung Fu movie where he belongs and Jay Chou reminds me here of why he was the only thing good about the recent “Green Hornet” movie. Don’t look for Michelle Yeoh to bust any moves as her role is little more than an extended cameo. As is David Carradine who appears in the last twenty minutes of the movie as the ruthless manager of a cadre of bloodthirsty fighters. Su takes them on in a really outstanding fight scene where he demonstrates the Drunken Fist, battling his opponents on a platform over a pit of hungry tigers. So should you see TRUE LEGEND? If you like Kung Fu movies I recommend it highly. I’ve read some reviews that claim the fight choreography is unmemorable and I have to wonder what movie those reviewers saw because I found the fight scenes in TRUE LEGEND exhilarating and exciting. The only odd thing about the movie is that it goes on for another twenty minutes for the battle against Carradine’s fighters when there really is no need as the movie’s story has ended but hey, I’m not gonna argue against twenty more minutes of Kung Fu mayhem, especially when it’s this much fun. TRUE LEGEND is no masterpiece of the genre but it’s a damn good movie and that’s all it has to be for me. Highly recommended.